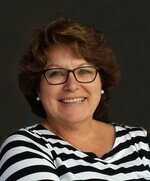 Karen Rauche Obituary - Haileybury, Ontario | Buffam Leveille Funeral Home Ltd.
Rauche, Karen (Chaput) 62, passed away unexpectedly on July 25, 2018. She had just begun what turned out to be a brief battle with cancer. She had accepted her recent diagnosis with courage and grace, never complaining and determined to fight as hard as she could. Karen is survived by her sons Nathan Chaput (Heather) and Jacob Rauche (Ela), her grandchildren Declan Chaput, Miles Chaput and Brixton Rauche, her mother Mabel Chaput, her brothers and sisters Christine Hedden (Doug), Chris Chaput (Jennifer), Wendy McCauley, Jane Pearson (Bruce), Tony Chaput, Todd Chaput (Heather), as well as numerous nieces and nephews. She was predeceased by her father, Gordon Chaput, brother-in-law Lloyd McCauley and nephew Kyle Pearson. Karen will be greatly missed and never forgotten, always remembered for her warm smile and kind heart. Family and friends are welcome to gather Wednesday, August 1 from 7 - 9 pm at the New Liskeard Golf Club for a Time to Remember Karen.There will be no service as per Karen’s request. Dear Mom, I want you to know that I’ve never looked up to anyone I’ve ever met like I looked up to you. Your optimism towards life, your morals, and your values, have made me the man I am today. You did the work of both parents growing up. I’ll never forget your dedication to me growing up bringing me to 5am hockey practices, or driving long hours in terrible weather to watch me play a single game. You always put everyone else in front of you because it made you smile. I know that all you wanted was for me to be happy and I am. I have a beautiful wife and an amazing son that I will always look after and make you proud. Your legacy will live on through the hearts of the people you have touched. Your family misses you Mom, but it’s time for you to rest now. I know you were joined with open arms and perhaps a totty and maybe even a round of golf. You’re my inspiration, my hero, I’ll love you forever Mom. Your little peanut will be safe and taken care of. This I promise you. I’ll see you again one day Mom.